Fast curing two pack epoxy impregnation primer for porous concrete floors . Overcoatable after 4 hrs. 5421 is a two pack epoxy rapid curing impregnation primer for floors to improve adhesion and reduce porosity on brittle and porous surfaces. Overcoatable after 4 hrs (at 20 degrees celsius). 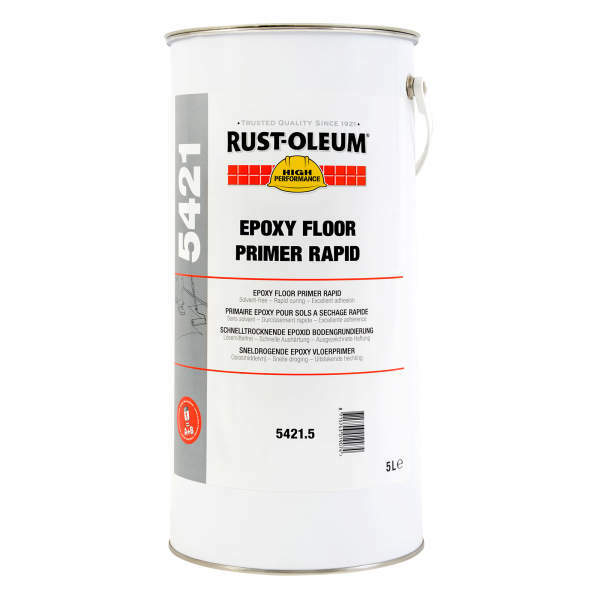 RUST-OLEUM EPOXY FLOOR PRIMER RAPID 5421 is a rapid curing 2-component solvent-free epoxy primer for floors. It has excellent penetration and binding power. Can be used with all Rust-Oleum® or Mathys epoxy and polyurethane coatings. Recoating time of only 4 hours allows application of primer and topcoat in one day. Concrete must be at least four weeks old, completely dry and free of surface laitance, contaminants, and previous poorly bonded coatings. Remove grease, oil and all other surface contaminations by alkaline or high pressure PREPARATION (steam) cleaning. Remove all previous coatings completely. For optimum results blast cleaning of the surface is recommended. Pour the liquid from the two smaller tins into the larger outer tin. Stir the mixture thoroughly until an even colour and consistency are obtained. Do not mix more material than can be applied in 30 min. If left longer in the tin, the material will become very hot and could pose a hazard. Also replace rollers and roller pan after 30 min. Apply with a medium pile simulated sheepskin roller, working well into the surface of the concrete. Replace rollers and roller pan after 30 min. Only apply in well ventilated conditions. 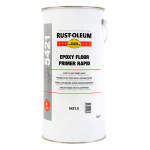 Immediately after use with Rust-Oleum® Thinner 160. Cleaning is impractical, so use disposable rollers and roller pans. Store the product between 10 and 25 °C for at least 12 hours prior to use.